Diabetes and its comorbidities pose a significant burden on people with diabetes (PWD) and their families, through out-of-pocket expenses for medications, devices, supplies, and the support needed to manage their illness. Rising direct and indirect costs of diabetes will become a drain on countries economies and undermine the financial stability of our health care systems. There is a significant fragmentation and separation of care pathways and available platforms thereby increasing the healthcare expenditure. It is forecasted that the total health and social care costs will rise to 9% of EU GDP by 2030. 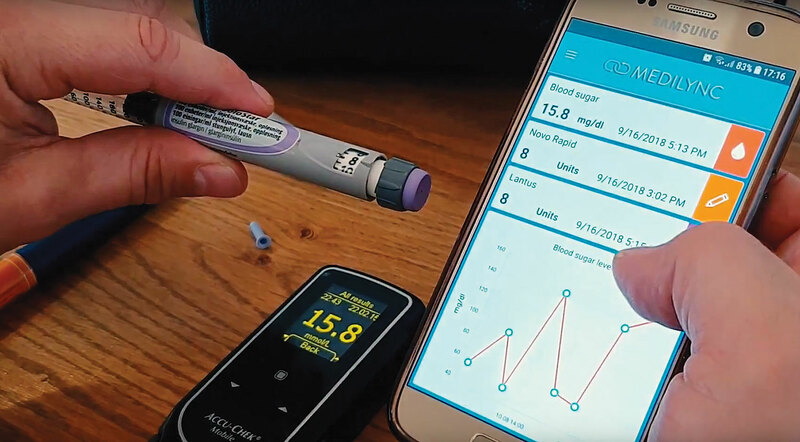 Medilync has developed a comprehensive solution to improve diabetes care with two interconnected software components: Insulync and Cloudlync. Insulync is the app designed for patients: it gathers all the data collected from different devices, or logged by the patient, and sent to the cloud. Cloudlync is the software backend hosted in the cloud. 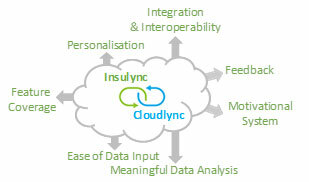 It automatically syncs and processes the data made available by the Insulync app. Furthermore, it is suitable for data integration with Electronic Health Records (EHR). Medilync is a start-up based in Iceland and founded in 2012 with the goal of revolutionizing the management and treatment of diabetes by digitalizing medical devices. The team is composed of computer scientists with strong expertise in IoT, machine learning and operations management, and of a marketing, sales and communications expert with past work experience in the healthcare sector. We are an award-winning company (with three awards granted by The Nordic Startup Awards) that has been recognised by different renowned institutions (such as Microsoft, European Commission) for our innovative ideas and growth potential. Medilync combines cloud-computing and big data aggregation and processing using machine learning and computer vision. This solution, called Cloudlync, is a platform that collects, stores, processes and provides real-time access to all stakeholders on relevant data from the patient: insulin doses, glucose levels, food intake, physical activity, etc. The interface of Cloudlync with the patient and its devices is made through Insulync app, designed to ensure that patients get really involved and commit to self-care. By gatthering data from patients devices Medilync‘s AI algorithms can map each patients pattern as to when insulin injections occur, when glucose measurements take place, even carb intake and excersise are monitored. Medilync calls it their Care Circle as the patient‘s extended network can be alerted if the patient forgets to inject or measure according to their pattern. After only few months of data gathering Medilyncs AI can also predict hyper- or hypoglycemic events which is the first in the market. This brings preventive measure into the hands of the patient and can keep them from being hospitalized. Such self empowerment of the patient is our core as Medilync is a patient centric company. We will optimize our platform & our mobile application Insulync to implement more features for better user experience, content, functionalities and integration with existing information systems using advanced machine-learning algorithms. We will also consolidate our foothold in 7 European countries and Canada. Studies have shown that the use of mobile health (mHealth) solutions to support patients and doctors in the management of chronic diseases can result in savings of € 76 billion of public expenditure and € 23 billion of private expenditure in Europe.